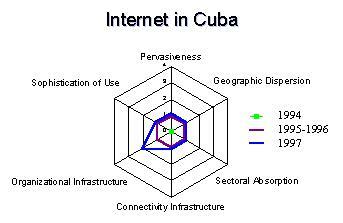 Geographic Dispersion: The only IP point of presence offering network connectivity in Cuba is at CENIAI in Havana. If; however, we consider email connectivity, we find access in every province and nearly every municipality. So, while Cuba must be rated at the single location level because of limited IP, they are clearly interested in geographic dispersion. Geographic dispersion: As long as the present regime remains in power, atypical emphases on geographic dispersion is likely.